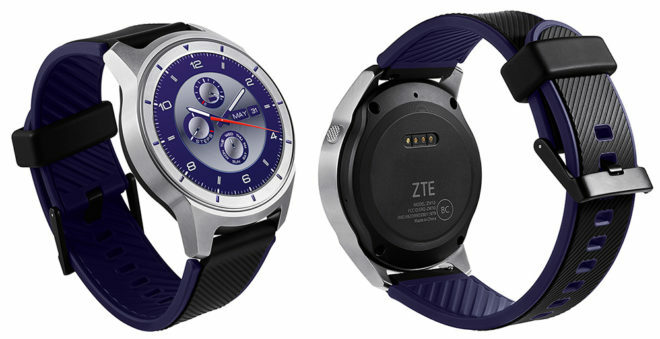 ZTE is getting into the smartwatch game, and it’s partnering with T-Mobile on its first effort. The ZTE Quartz is now official. This Android Wear 2.0 smartwatch is launching exclusively at T-Mobile, with online availability starting April 14. Select T-Mo stores will begin stocking the Quartz one week later on April 21. ZTE’s Quartz will cost $192. In exchange for your hard-earned dollars, you’ll get a smartwatch with a round 1.4-inch 400×400 AMOLED display with Gorilla Glass 3, quad-core Snapdragon Wear 2100 processor, 768MB of RAM, 4GB of storage, and a 500mAh battery. Also included is a built-in speaker and mic for doing things like talking to Google Assistant, as well as an accelerometer, gyroscope, and barometer. Built-in cellular connectivity (EDGE and HSPA) means that you’ll be able to do things like make calls when your smartphone isn’t nearby. All of those features are wrapped in a case that’s IP67-certified for dust and water resistance. The ZTE Quartz offers support for interchangeable 22mm bands, as well. The Quartz’s dimensions are 46 x 46 x 14.5mm. Two other details worth noting about the ZTE Quartz are its lack of NFC and a heart rate monitor. That means that you won’t be using the device for Android Pay or for fitness tracking. The ZTE Quartz looks like it could be a solid smartwatch. The lack of features like NFC and a heart rate monitor is kind of a bummer, but that’s the trade-off that ZTE made to get the Quartz’s price down. If you don’t really care about those features or you’re just looking to get a new smartwatch on the cheap, the Quartz could be worth a look. Very Interesting. I own a ZTE Axon 7, and besides the “Waiting for Network” error that pops up in the play store, this phone has been rock solid. I was waiting for ZTE to join the Smart Watch Game, and they have, at a reasonable price. I will be looking out for Tmobile specials. If this watch goes below $150, i will pull the trigger. I switched to LineageOS and never had that error. I went back to a stock based ROM to get out wifi calling & couldn’t stand that issue lol. Back in topic, I don’t like that they didn’t put LTE in the watch. All of Tmobiles new coverage is LTE only. I’m leery of ZTE since they were found to be aiding terrorists. But they have paid a fine for that. I was close to wanting an Axon, but now, much less so. Did they fix that horrid bell thing everyone hated, by the way? On top of that, the design flaw of a nonremovable battery gives me at least a little pause. Definitely good to be leery of ZTE. I am too, but not only because of the terrorist funding. I had a very major issue with their U.S. operations last year when they introduced their “Z-Community” in which they launched late Spring with a contest of the top five contributors winning a free Axon 7. I was one of those five winners after have spent several hours over the course of the contest, and even weeks after it ended still helping to promote their company on the website. Never in that time did I receive the Axon 7, and then ended up ina really bad situation with the site director, who discriminated against me, sent me really inappropriate emails, then banned me from the site. I had difficulty trying to get their corporate people involved to get the Axon 7 to me, which I ended up having to get a family attorney involved to do so. While the smartphone was fine for a while, it died suddenly after the Android 7 update during use with the Google Daydream View headset. Since sending the dead phone back to me damaged from their repair center, I’m still figuring out what I’m going to do about it now. Thanks for describing that…. that’s terrible. Puts the nail in the coffin of my ever getting a ZTE! I have 2 ZTE WiFi Hotspots… did i just fund terrorist??? No, but you just made this man smile. I think you paid for a new coat of paint on that nuclear missile! Don’t worry about it. I bought a Toshiba VCR back in the eighties right before they were fined for selling machinery to the Soviets to make their submarine propellers quieter. Now I bought a ZTE Axon 7 mini. How do you know? I dont know what you guys are talking about. Most pain points are the result of the customer, not the company. I love my Axon 7. Not one issue. No bricking, no audio issues. I have received 2 updates in the 3 months I have owned the phone. This phone os on Android 7.1.1. How many other 1 year old phones can you find with Nougat on them already?? A+ so far in my book for a phone manufacturer. If you guys don’t like it, then cough up your $750 for an iphone or a Samdung… Maybe your phone will blow up, or you will have to buy new cables and ear plugs with every new iphone you buy. I’d rather have my phone blow up than have my country blow up. The lack of fitness tracking is a 100% dealbreaker. I just hope it is not a typical Android Wear watch with 8 hour battery life. My Fossil Q lasts about 12 hours or more on a normal day, and Wear 2.0 just made it a hell of a lot better. Congratulations, you have a watch with poor battery life, one star out of two. What is a “hell of a lot better” than 12 hours? Does it do 18 now? My watch can do 3 or 4 days between charges. I’d give it two stars out of 5 on battery life. There’s no reason other than bad design that these things can’t do a week or two on the battery. Is there a reason you can’t charge it at night? I have 0 desire to wear my watch at night, it’s not designed like a FitBit. Yes, there is a reason it can’t do a week or 2 on battery life. 1) mobile processor 2) RAM 3) full-color screen. This isn’t a grayscale digital watch that just sets alarms, ya know. Plus, you said 8 hours. My 12+ hours is 50%+ longer than you mentioned. Maybe mean what you say, instead of speaking in hyperboles. I wear mine at night, so I can easily see what time it is if I have to. …..Those aren’t reasons. They can do things like larger battery and battery in the band even. Or other technical fixes. The badly designed ones will still sell badly. But still lousy, and not enough to get you through your day. A hyperbola is a type of curve. But I was straight and exact in what I said. How long are you out? It works for me, I’m not out for 18 hours a day. It gets me through my day by a long, long shot, every day. And I corrected that before you responded. Good try, though. I’ve had a few of these watches, including the first Pebble (the band broke, and it was too difficult to find a replacement, the the buttons were really bad) and the hideous Motorola puck with the flat tire. The big design flaw is the two side buttons being on the back side to discourage usage. A device where you have to “charge it before bed” is a complete fail. Yeah, I am too lazy. Just like I would be too lazy to drive a hypothetical Buick with a gas tank that only fit 3 gallons and make me stop at every gas station I passed. The problem is not my “laziness”: it is in the bad design of some products. I guess smartphones are a complete fail too? Damn having to,charge my phone every day. Damn you battery technology!!! I guess a VW Passat TDI is better/more desirable than a Bugatti Chiron then? That’s according to your logic. I think you meant over 24 hours. I think you’re referring to the Apple offering. Ah. the LG Watch Sport gets one and one half stars out of 5, instead of just one star. My Samsung Frontier last me roughly 3 days untill I need to charge it. Mine goes beyond 3. I hope it is not coincidence that no Android Wear watch has anything other than really bad battery life. *sigh* another watch without NFC. I don’t care about HR monitor or cellular connectivity, but NFC is a must on my next smartwatch. I assume this requires the watch to be an added line of service? Does this come with a SIM card slot or it has Digital IMEI number? No NFC and no LTE. COME ON T-Mobile, offer something worthy and stop riding the Apple/Samsung train. If you want a real sport watch, then Fenix 5 is the one to get. This is a fashion watch with some sport tracking on it. Wow that’s shocking specs! except the one thing stand alone feature that would have been the sell point. Good find I’ve been searching for best smart watch on many levels. Thanks for sharing! Apple is taking too long to release Apple Watch 2. I am so tempted to get an Apple Watch but I don’t want to buy it at the end of the cycle. Me too! No one has an answer as though Apple gave up on it or maybe release the new 3rd gen! Well whatever happens I hope soon because I may just get this on jump on demand and once apple does come again I’ll jump watch. I Brett totally get your point it’s like buying a car why pay almost for the same price for the new model that’s how I am right now. How you thought of just buying this watch on JOD?